The ceremonial ground-breaking for the Gold Star Family Monument Memorial planned outside Franklin Boys Preparatory Academy in East Tampa. 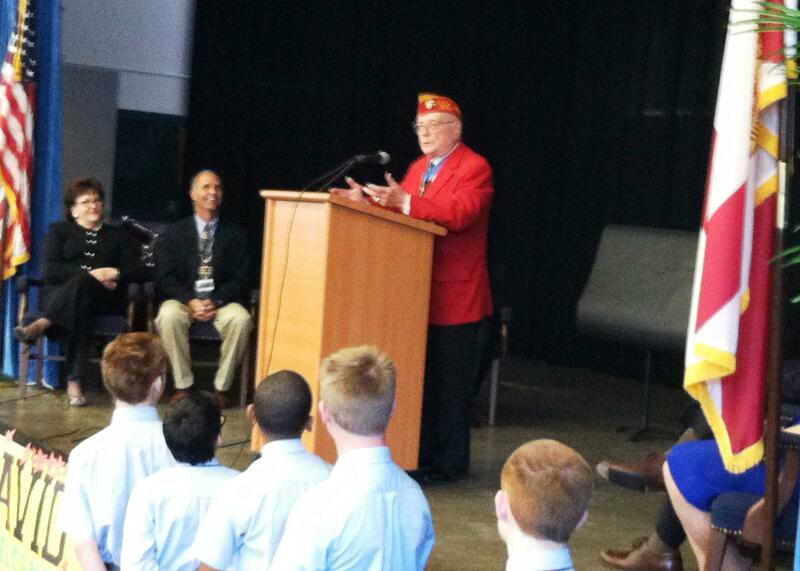 Marine Corporal Hershel "Woody" Williams addressing the students at Franklin BPA. It was 69 years ago when Marine Corporal Hershel Williams single-handedly took out seven Japanese pillboxes on Iwo Jima - displaying valor that earned him the Medal of Honor. 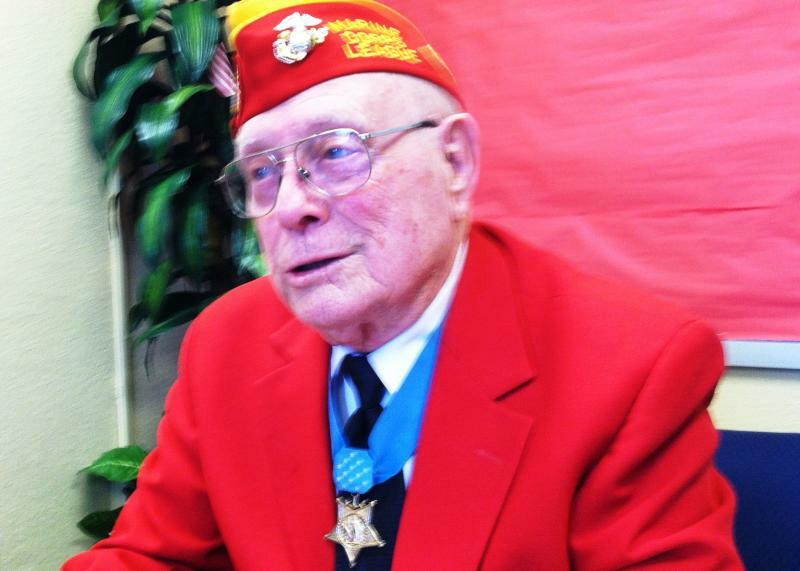 A World War II veteran of Iwo Jima and recipient of the Medal of Honor is counting on hundreds of teenage boys at a Tampa public school to honor his dream. Marine Corporal Hershel “Woody” Williams’ vision is to build a memorial in every state honoring Gold Star families, the spouses, parents, children and extended family members of military men and women who have been killed in combat. Williams was invited to speak to students at Franklin Boys Preparatory Academy, 3915 E. Columbus Ave., Tampa, after the students decided to build a Gold Star Family memorial for their capstone project. The 90-year-old Marine wore a bright red jacket that contrasted with the pale blue ribbon of the Medal of Honor fastened around his neck. In the room, is fellow Marine Master Sergeant Will Price, who called Williams a living legend of the Corps. The iconic photograph of Marines raising the American Flag on Mount Suribachi, Iwo Jima, February 23, 1945. Williams still chokes up a little when recounting February 23, 1945. 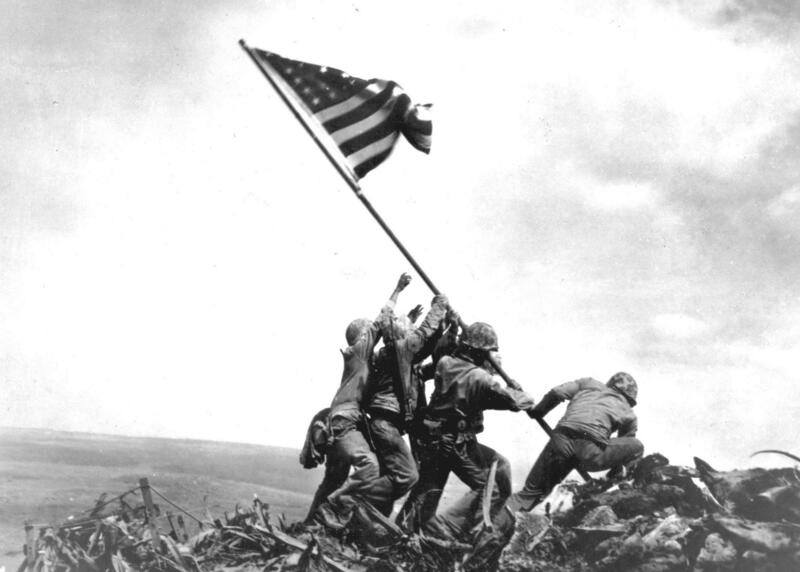 That was the day the Marines raised an American Flag on Mount Suribachi on Iwo Jima. It’s a historic photograph that was turned into an iconic statute. Yet, it’s something Williams didn’t witness because it’s also the day he, under constant machine gun fire, using six flamethrowers took out seven Japanese pillboxes – single-handedly. “They never touched me in that four hours. And there is no answer in my mind for that, but had another purpose. I think God had another purpose. Maybe I’m fulfilling that purpose. I hope I am,” Williams said. Williams’ purpose now is to honor Gold Star families by getting memorials built in all 50 states in the next five years. And Florida’s will be built in front of Franklin Boys Preparatory Academy if Adam Wallace has his way. Wallace is part of the student government leadership at the historic brick school in East Tampa. “I’m extremely confident that we’ll be able to finish this project by the end of 2014 because we’re in the state of Florida, many veterans live here, many families,” Wallace said. He said the academy needs to raise $40,000 to build the monument. And to kick-off their effort, Williams brought a check for $5,000 from his foundation, the Hershel “Woody” Williams Medal of Honor Foundation. A powerful, photographic tribute to American soldiers and Marines from the Civil War to the Iraq War opens Tuesday at the St. Petersburg Museum of History. From the opening panel of the American Soldier exhibit – you immediately see the difference. The photo of the Union soldier from Civil War is staged in a photographer’s studio. He poses with his rifle. The Iraq War soldier is in an urban warfare setting, his finger poised on the trigger of his AK-47. Special Forces are considered the military’s elite - the Rangers, Green Berets, and Navy SEALS among others. And the elite of the elite are the Special Forces who have been awarded the Medal of Honor. Two of them were recognized this week and their names added to the Special Operations Memorial Wall of Honor at MacDill Air Force Base in Tampa. 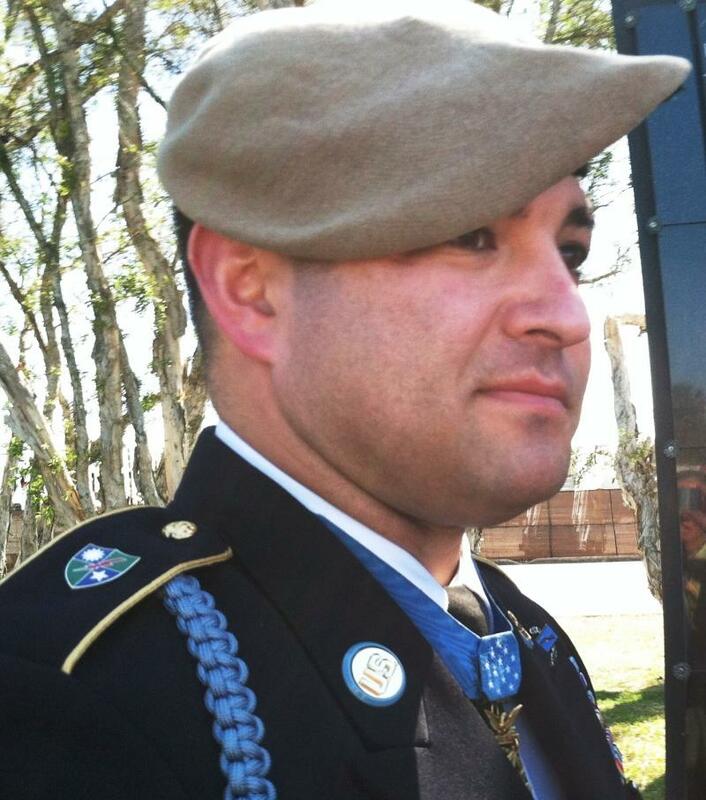 Sergeant First Class Leroy Petry, an Army Ranger, watched as his name was unveiled. It is one of 45 names etched into the black granite tiles. Florida Gov. Rick Scott today, Dec. 12, 2012, will honor the Oviedo family of Green Beret Staff Sgt. Robert Miller. His name will be included in Florida's Wall of Honor in Tallahassee. The Special Forces soldier was killed during a battle in Afghanistan in January 2008. 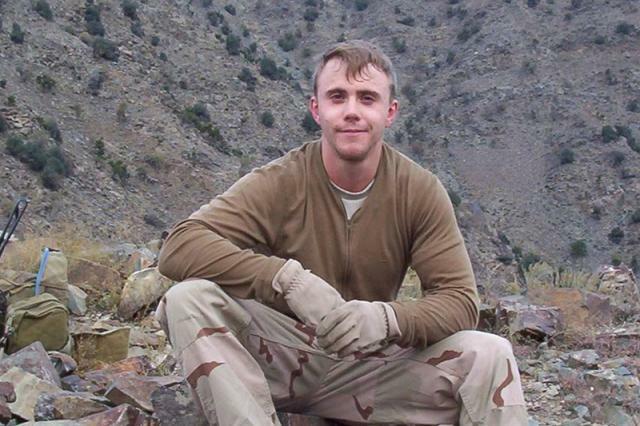 Miller was awarded the Medal of Honor in 2010 for his heroism and valor during that combat. It took four hours, six flame-throwers and the lives of two fellow Marines before Cpl. Hershel "Woody" Williams knocked out seven Japanese pillboxes on Iwo Jima February 23, 1945. It was his fourth day on the Pacific island. Williams said six members of his original special weapons unit had been killed and he was the sole survivor.